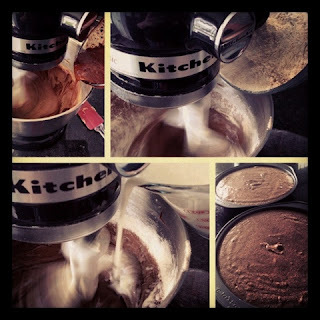 I love baking birthday cakes. Last month, I made the chocolate rose cake for Tim's aunt and it was a total hit. 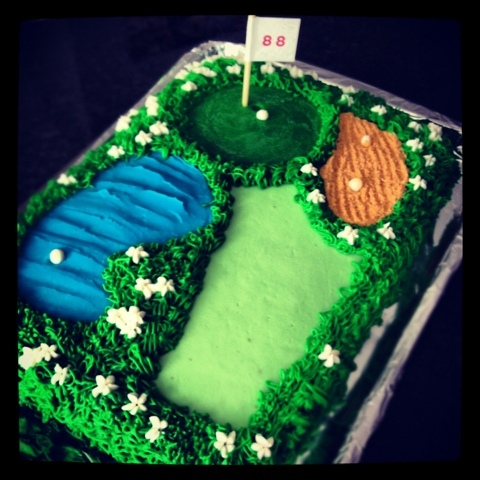 This past weekend, I had the pleasure of baking Grandpa's 88th birthday cake. I pondered what kind cake I'd make and with what design for quite some time. Then, a stroke of Pinterest genius hit me... golf cake. Gramps loves golf. He's 88 and he stills walks the entire 18 holes. No golf cart for that ol' trooper. I started with my devils food chocolate cake, thinking I'd make a double-layer round. But something went horribly wrong and it turned into an ever-oozing lava cake in my oven and then one of the layers split apart in the cooling stage. WTF?! So in the time crunch I was in, I reverted to the quick and easy recipe I used for the margarita cupcakes (sans lime, of course). 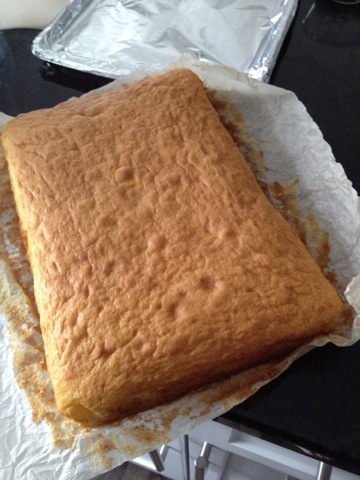 I made a 9x12 vanilla cake with the intentions of making the decoration the high point. And boy was it. I used purely buttercream for the decorations. I loathe fondant. I don't know why anyone would choose to eat it... So why bother using it? I'm of the belief that taste always trumps the look. 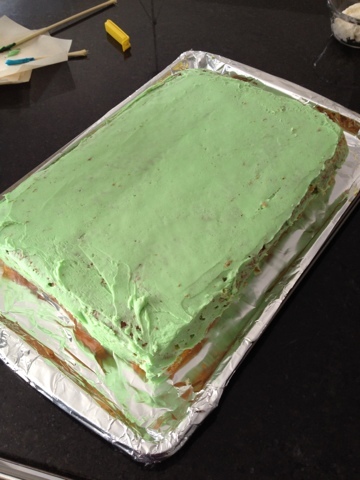 I started with a crumb coat... And then I had at 'er! I made a 'fairway, green, pond, and sand trap. 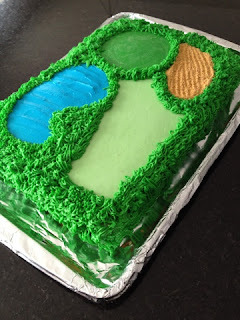 I used a grass tip to make the surrounding greenery, pulled up the buttercream in the pond to replicate waves, used graham crumbs for the sand trap and a skewer for the flag stick. And I added some white flowers for good measure. 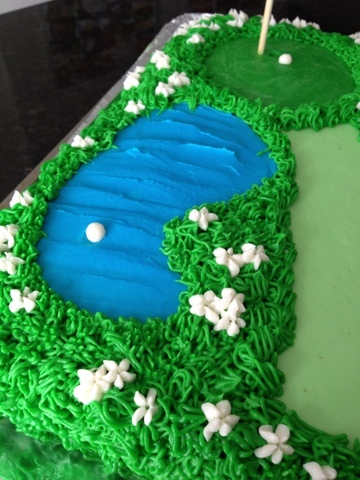 Yes, I'm well aware that golf courses aren't typically strewn with pretty white flowers, but this is a cake and, heck, I wanted them. So there. What sand trap doesn't have a few balls in it? In the end, the cake was yummy. Not quite as amazing as the moist delicious devils food, but definitely good. The decorations were the real hit. 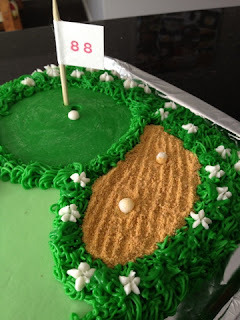 Gramps loved his cake so much that he took photos of it for show & tell with his golfing buddies. That'swhatI'mtalkinabout!! !